With police, fire departments and government officials always on the frontline, PIOs often need to juggle both the unexpected and daily community relations. Even on a “slow” day, do you have the time to track and analyze media commentary and public reactions? You may feel the need for broadcast media monitoring most acutely during a crisis, but you can also put it to use every day to strengthen your community outreach initiatives. With easy access to qualitative and quantitative data and news segments, you can craft communications plans that further the mission and vision of your organization. Plus, you’ll be liberated from the tedious task of reviewing hundreds of news segments. In our new playbook, you’ll learn more about why broadcast media monitoring is a must-have for PIOs tasked with building strong relationships between your organization and the communities it serves. 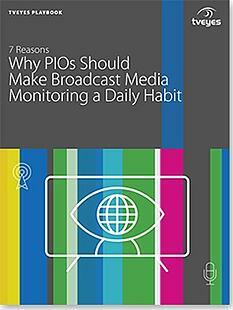 This playbook makes the case for integrating broadcast media monitoring into your daily communications activities. Download your free playbook today and learn how broadcast media monitoring can help you simplify your days and build stronger community relationships.